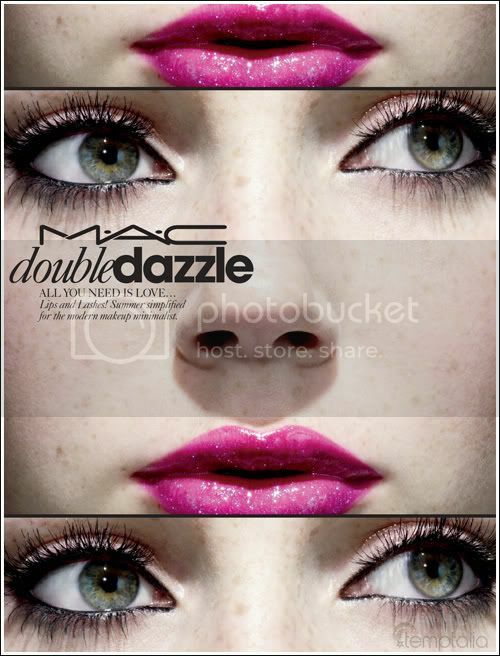 [Lipglosseater]: MAC Double Dazzle Collection! All you need is Love… Lips and Lashes! Summer simplified for the modern makeup minimalist. Double Dazzle will daze the closest competition with colour-changing, light-reflecting pearl-shine lips; paired with a new formula for the ultimate in voluptuous lashes, et voilà! Lips lead: seven new Dazzleglass shades bring the scintillating selection up to 18! The flotilla-of-lights formula imparts the pearl combination with mega-glisten shine, creamy comfort and the subtle sensation of vanilla. Lashes follow: multiplied, volumized, utterly glorified by our newest eye innovation…This sly new small-and-mighty brush has been developed to capture and emphasize each and every lash. Lips, Lashes, Lovers…Look out! The Dazzleglasses are back!!! 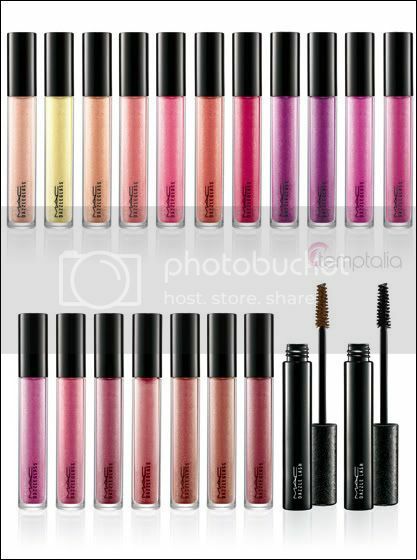 *screams* Though i'm personally bummed that they didn't bring back Comet Blue, which i'm DYING to own, but i'm pretty excited about these glosses! I'll definitely be getting Goldyrocks, but may get one or two other glosses depending on how much i like them! :D I heard from Cozycot that this is out at Changi already! I also remember reading somewhere (but can for the life of me remember where) that this is available in KL as well! So do check them out!! :D This collection will be available in the US / Online on April 30th! Word goes that this collection will be permenant (but don't quote me on that!! ), but i'll definitely be making a beeline to the MAC store the moment this launches locally! hehehe!! Will you be getting anything from this collection? Nope... didn't get my items from the spree yet. I know it's normal for it to take approx a month, terlalu impatient hahaha. Hahaha you are skipping Sugar Sweet and Grand Duos to get ARR and Double Dazzle! The name lipglosseater fits you hahaha. Since you like lipglosses, are you tempted to get the dazzleglasses from Kitty Kouture? Red She Said? EH!!! Wasn't it released last year!? WHY so slow? When will they bring in the newer collections? OMG! Slower than Malaysia by so much, and Malaysia isn't fast in the first place haha. I shouldn't read your blog, you always tempt me with posts about the new collections.. Bad Jenn! LOL yeah!! And probably blusheater as well (CORNY, but yeah!!)! i love lipglasses and blushes!! :S Actually this year i'm trying to control my spending on MAC. I still can't believe how much i blew last year man!! One by one, all those things add up! so this year, i'll only get those i reallly reallly like! So far i'm able to resist all collections this year already... wish me luck!! hahaha!! :) I'll make an exception for HK though, cuz its like a MAC anniversary thing so i'll be buying for collection's sake. I'll probably skip the KK dazzleglasses! You're actually just paying for the Kitty charm, since it's removable and the dazzleglass packaging not special! And i don't even like HK to begin with! lol! US$28 for a miserly 1.92gms is daylight robbery! EXACTLY!! Red she said was released in the states last October. *tears hair out* Hello Kitty will finally be here dunno this week or next week. Maybe i should give my MA a call again and see. I've so many collections to catchup on! Fedup of waiting already!! Awww... i'm sorry!! hahaha!! Can't blame a MAC fan for being excited about upcoming collections can ya! :D Dun leave meeee!! hahahaha! !